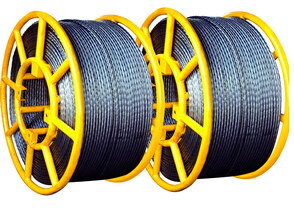 The braided steel strand has high flexibility, complete stability to rotation under tension force. It can homogeneously distribute the pressure between the elementary wires. The special rope can increase efficiency during the overhead transmission line stringing work. 1. The anti twisting steel wire rope will be packed in steel drum. 2. The steel drum can be installed in the reel winder of puller directly. 3. We have 25 years of production experience, and more than 1000 customers in the country and abroad market. The anti twisting braided steel wire rope have been sold to more than 40 countries in the world. 4. Customer specially ordered products are available, such as special size or special breaking load.